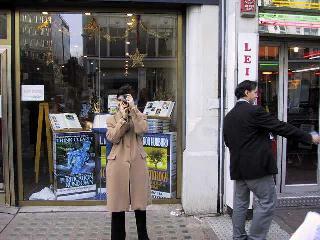 These two photographs were taken by protesters during one of the many world-wide protests against the killing of Lisa McPherson by the notorious Scientology® cult. Even though the cult has sued people who exposed the fact that the Narconon® organization is actually Scientology, the cult never-the-less produces and publically exhibits the displays you see here. 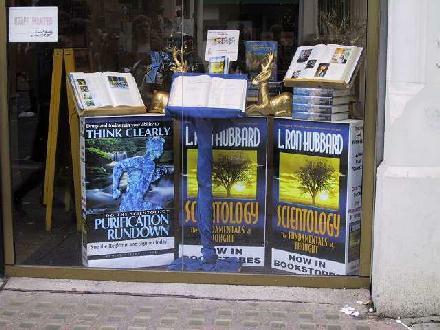 The "L. Ron Hubbard" in the poster to the right in the first photograph is, of course, the founder of the cult. He developed the so-called "Purification Rundown" quack medical process that is advertised in the poster on the left of the first photograph. The cult's "Purification Rundown" quack medical proceedures are an integral part of the Narconon organization's proceedures -- which are widely described and discussed in the pages of the "Don't get CONned by NarCONon" web site created by the Skeptic Tank. The individual taking the photograph of the protesters, incidentally, is likely a member of the cult's Guardian Office / Office of Special Affairs, the department within the cult that had so many ringleaders sent to prison after the 1977 felony raids against the cult. This photograph is important since it underscores the holy stature that the organization places in its dead messiah. In conjunction with the cult's deadly and dangerous Narconon program, it describes nicely why the organization is unwilling to alter their putative drug treatment / addiction program to make it less destructive or to actually change their treatments to be even marginally effective. They're not allowed to alter their messiah's writings and so their deadly and dangerous quack medical proceedures remain.